There are certain rules to traveling like, learn about the culture before you get there and, don’t be rude to your hosts. Yet there’s one important rule that is often overlooked, or at least, can be left left open to interpretation: don’t trash the place. 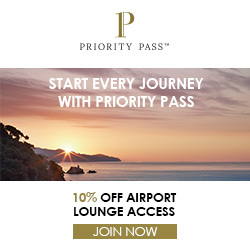 As frequent travelers, we run the risk of leaving a heavy carbon footprint wherever we go - it’s not something that can fully be avoided if your only options are catching a flight or hitching a ride somewhere. But there are choices that we can make to cut down on waste while we travel and make a minimal environmental impact on the cities and countries we visit. 1. Carry a stainless steel water bottle (or other another reusable bottle of your choice). The upside to stainless steel is that it can hold both hot and cold liquids, so you can use it for different drinks throughout the day. 2. Get yourself a reusable straw and, well, reuse it! You won’t need to use and then toss a plastic straw at restaurants if you’re carrying your own. 3. Keep a few cotton produce bags in your carry on. They won’t take up any space and will save you from having to buy plastic bags when you visit your local market. 4. 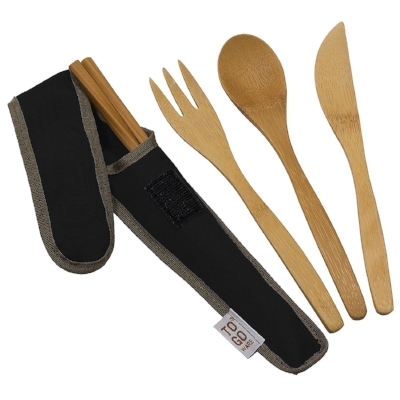 Reusable bamboo travel cutlery sets like this one come with a fork, knife, and spoon inside a portable carrying case. 5. And while we’re on the topic of bamboo, bamboo toothbrushes work just as well as the standard plastic variety but are actually biodegradable - which can make a significant difference since it’s recommended you get a new toothbrush every 3 months. 6. Use bar soap and bar shampoo instead of the stuff that comes in a bottle. A general rule of thumb is that if you can use it on your skin, you can use it on your hair. But if you want something made specifically for your tresses, Lush is one of many brands known for making bars of shampoo that eco-conscious travelers won’t stop raving about. 7. And if you really want to commit to the cause, make your own toothpaste by mixing baking soda, coconut oil, peppermint oil and a bit of charcoal (to boost whitening) - using items you purchase once you make it to your destination, of course. Every frequent traveler’s mantra is to pack only what they need and as little of it as possible. By making a few switches to eco-friendly products you’ll end up with a bit more space in your bags since you’ll have put more thought into every item you’re packing. And sure following a zero-waste lifestyle doesn't mean that you won’t be producing any waste, but every bit helps keep our favorite beaches and cities clean so we can keep going back.